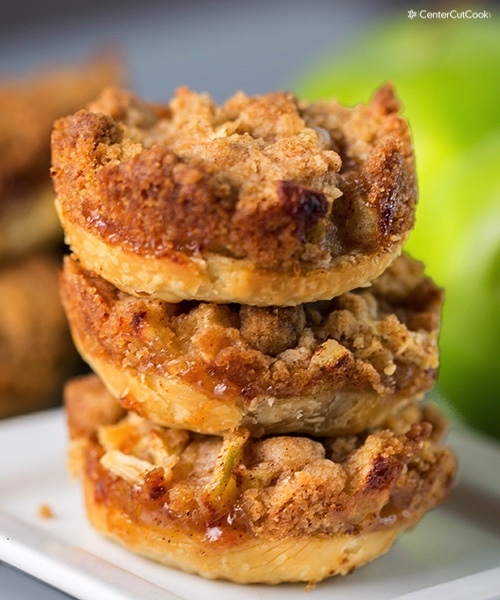 Mini Apple Pies with a crumbly streusel topping – an easy recipe made in a muffin tin! Apple Pie is one of those classic all-american, old-fashioned recipes that brings back so many wonderful memories of spending time with my family on Sunday night, playing games, and enjoying a slice of Mom’s homemade apple pie. With a buttery crust, and packed to the brim with spiced Granny Smith apples, it was and still remains a favorite! There are hundreds of apple pie recipe variations out there; everyone from Martha Stewart to Betty Crocker seems to have their perfected recipe. 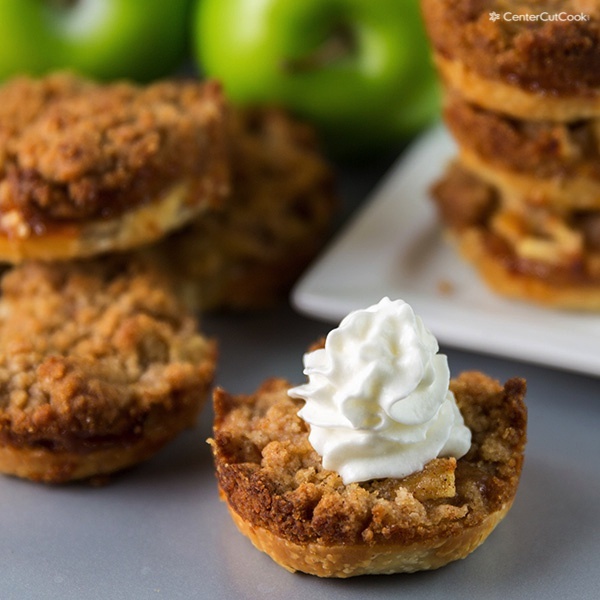 Instead of tackling traditional apple pie, or apple pie baked in apples (another fun variation I’d love to try), I decided I’d put my own little twist on it and try Mini Apple Pies with a crumble top. 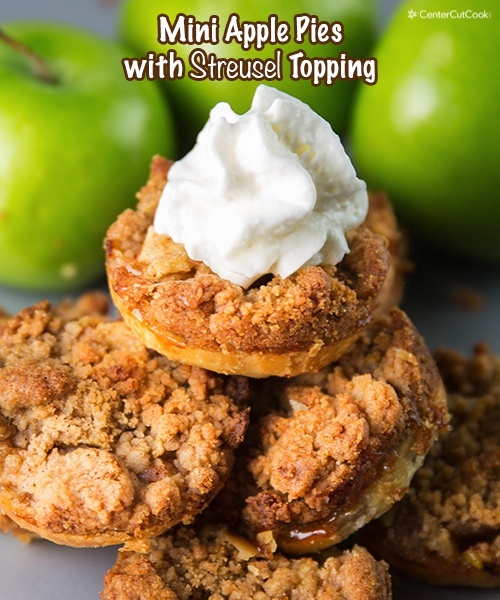 These Mini Apple Pies with Streusel Topping did not disappoint, so I’m excited to share this recipe with you today! 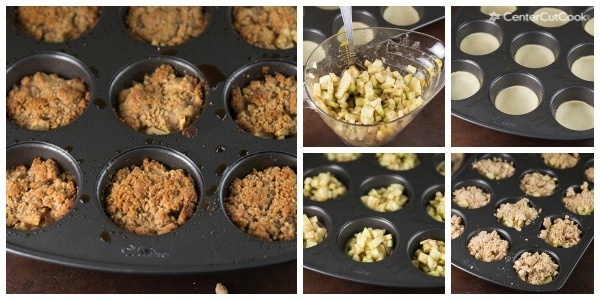 These cute little mini apple pies are made very easily in a muffin tin. Make your own crust (The Pioneer Woman has a fantastic recipe I have used in the past) or use a pre-made refrigerated crust. Sometimes I make my own, sometimes it’s helpful to just use a pre-made crust. You’ll use a 3 inch circle cookie cutter (or any other round shape- perhaps a glass) to cut 12 circles out of the pie dough. Next comes the apples mixture- I simply use chopped Granny Smith Apples, a little flour, cinnamon, sugar, and a splash of lemon juice. This comes together so quickly that there’s no reason to use canned apple pie filling! My favorite part about this entire recipe is the crumble topping – buttery with cinnamon! Yum! You will use your food processor or a fork to combine flour, sugar, butter, and cinnamon together to create the streusel topping. These little guys will bake up quickly, only 18-20 minutes until they are perfectly baked! It’s a great recipe for kids to help with, too! They can help you by cutting out each circle of pie dough, or assist in filling each little pie cup. If you’re using refrigerated, pre-made pie crust, one pie crust is enough for 12 mini pie cups. Double the recipe if you’d like to use up both crusts. Allow the cups to cool for about 15-20 minutes before removing them from the muffin tin. Serve with whipped cream, and enjoy! PS: Are you following me on Pinterest yet? I’d love if you’d follow along! You can follow me here: Follow CenterCutCook on Pinterest. Thank you so much for reading, commenting, and sharing these recipes with your friends and family! I appreciate YOU so much! Unroll 1 refrigerated pie crust onto work surface. Use a 3-inch cookie cutter to cut out 12 rounds. Spray a muffin tin with non-stick cooking spray. Place each round into the bottom of a muffin cup. The dough should just start to slightly go up the side of the muffin cup. In a large bowl, combine finely chopped apples with 3 tablespoons sugar, 1 tablespoon all-purpose flour, 3/4 teaspoon cinnamon and 1 teaspoon lemon juice. Divide this apple mixture evenly among the 12 mini pies. With your food processor, a fork, or using your fingers, combine all of the ingredients for the streusel topping until crumbly. Divide this mixture evenly among the 12 mini pies. Bake for 18-20 minutes or until the tops are golden brown. Allow the mini pies to cool for 15-20 minutes before carefully removing them from the pan. Topped with whipped cream if you wish and enjoy!